Posted on May 24, 2016 by Mike Sonnenberg Posted in courthouses	. One of the things I have found on my travels around Michigan, are the many Civil War monuments in some of the cities in the state. I found this one on the Grand Traverse County courthouse lawn in Traverse City. 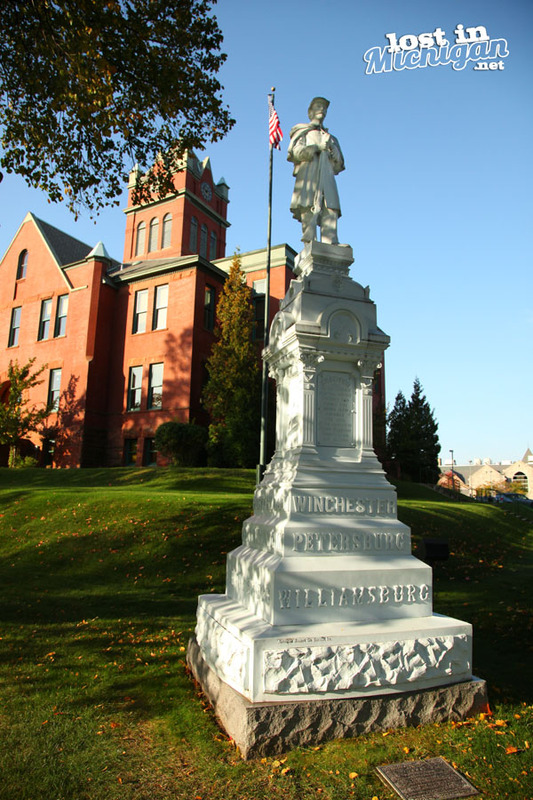 On May 30, 1890 the Mayor of Traverse City, Perry Hannah, welcomed the Civil War Soldier statue to the grounds of the original courthouse on Cass Street. 4,000 citizens and over 300 Civil War veterans attended the unveiling. This statues represents the 171 volunteers from the Traverse Area who marched in the War. The sides of the monument lists the major battlefields where the region’s soldiers fought from 1861 to 1865. Thirty-two local men gave their lives in the conflict.